I took my first ride in a Class 717 train today, between Moorgate and Finsbury Park stations. The interior of the train is very like the Class 700 train. Seating is 2 + 2, as opposed to 2 + 3 in the current Class 313 trains. There is wi-fi and power sockets. The colour scheme is rather grey. They are a functional train, rather than a design classic. I think that some will not like the seats. One Class 717 train has 362 seats, whereas two current Class 313 trains will have 462 seats. The seats are hard and not particularly comfortable. There are no seat-back tables or cup holders. On the other hand, there is a lot of standing space, so those with sensitive bottoms can easily stand. Some of Great Northern’s passengers have a choice of route to the centre of London. Greater Anglia also has a service to the other side of Hertford and this year, the company will be introducing new Class 720 trains. This article on Railway Gazette is entitled No ‘Ironing Board’ Seats, Greater Anglia Promises. If they keep their promises, will those that can, change their route to London? London Overground is also running new Class 710 trains, through Enfield. These trains use longitudinal seating, so won’t be to everyone’s taste, but it will be interesting to see if they increase ridership when they replace the elderly Class 315 trains. The Class 710 trains will be Transport for London’s fourth train with longitudinal seating, following the S Stock for the Sub-Surface Lines, the Class 345 train for Crossrail and the Class 378 trains for the Overground, so hopefully the new trains will be well-designed. I travel regularly in S Stock, Class 345 and Class 378 trains and find them preferable to both the Class 700 and Class 717 trains. You can stretch your legs into the aisle. The seat backs have a better profile. Passengers opposite are some distance away, so you have your own space. To try to solve the problem, I went for a ride in a Class 378 train between Harringay Green Lanes and Barking stations. Passengers were observed to do the following, when sitting in the longitudinal seats.. Put their bags on the floor between their legs or on their laps. Slump back in the seats , often with their head resting on the window or the frame of the train. Put their legs out in front, although several had their legs crossed. All looked to be comfortable. One thing that is missing is a USB charging point in the armrest. 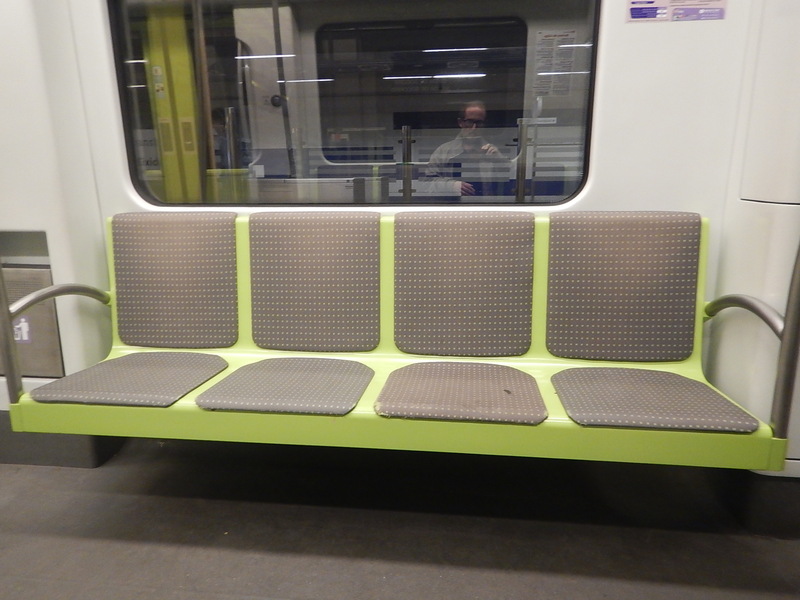 Shown is the seat on a Class 230 train. Uncomfortable seats are to my mind, a good way to upset customers. 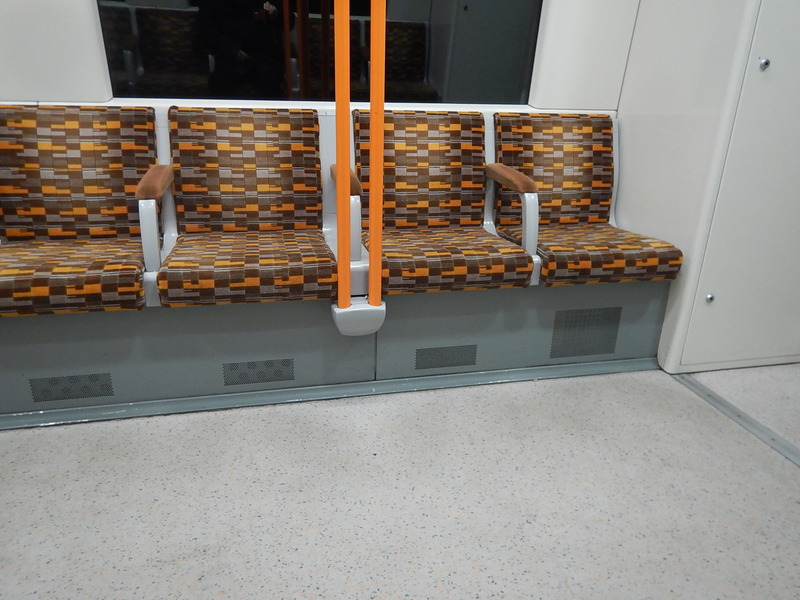 These are longitudinal seats on a Class 378 train on the Overground. 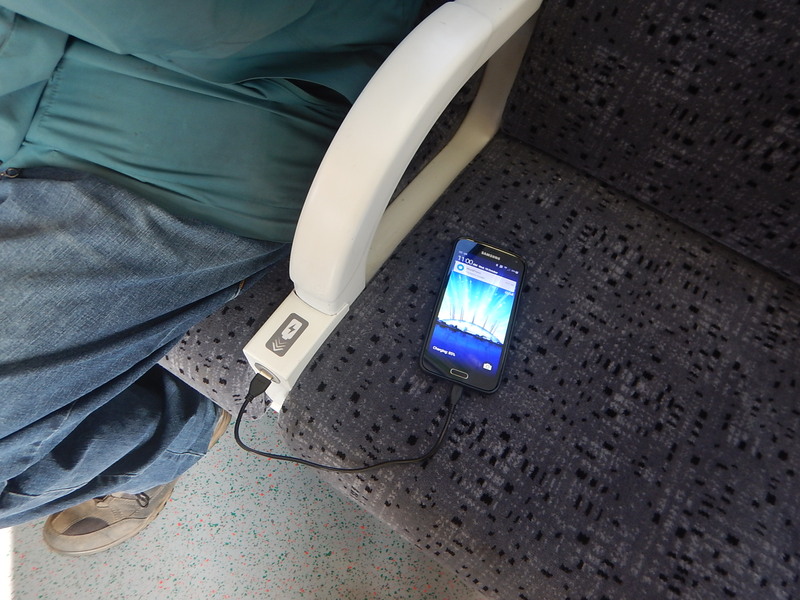 The Class 230 train charging points could surely be added. How would London’s bottoms respond to these seats on a similar route in Valencia? They make the seats on Class 700 and 717 trains appear soft! I used to commute from Kings Cross to Welwyn Garden City. I wouldn’t want to do it every day in these trains.